From La France newspaper, July 6, 1895: The puzzle instructions read, "Use the numbers 1 to 9 each nine times to complete the grid in such a way that the horizontal, vertical, and two main diagonal lines all add up to the same total." ↑ Lawler, E. L. (1985). The Traveling Salesman Problem: A Guided Tour of Combinatorial Optimization. West Sussex: John Wiley & Sons. ISBN 0-471-90413-9. ↑ Hayes, Brian (2006). "Unwed Numbers". American Scientist. 94 (1): 12–15. doi:10.1511/2006.57.3475. ↑ Pegg, Ed, Jr. (September 15, 2005). 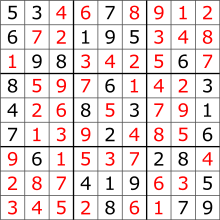 "Ed Pegg Jr.'s Math Games: Sudoku Variations". MAA Online. The Mathematical Association of America. Retrieved October 3, 2006.